On rare occasions an author translates a transformative experience into a written account that is an inspirational call to the reader. Written works with environmental themes from Walden to Red: Passion and Patience In The Desert and The End of Nature come immediately to mind. 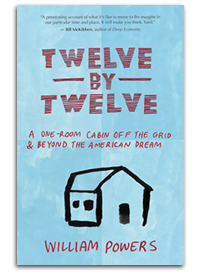 Add to the short list of essential readings on ecology and nature William Powers' inspirational Twelve by Twelve, A One Room Cabin Off The Grid & Beyond the American Dream. 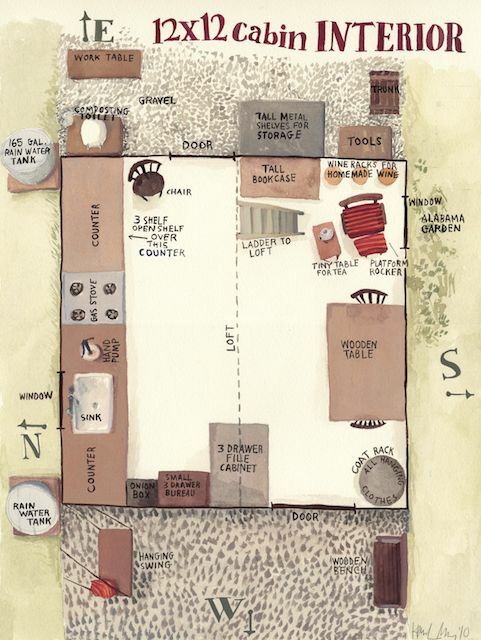 Powers' book provides for an entrancing account of his time living in No Name Creek North Carolina after accepting an invitation from Dr. Jackie Benton to live in her cabin which has a 12 X 12 footprint and is completely off the grid. After spending a decade in remote areas around the world doing international aid work, returning to the States was a shock to Powers' system and in his time at No Name Creek he discovers the expansive nature of simplicity. The relationships he established with the natural world and the local community during his time there illustrate how it is possible and supremely fulfilling to live a truly sustainable life. I spoke with the author as he was preparing once again to travel abroad. JC: Bradley Jamison, I assume you changed his name, but this is a very intriguing character who has taken this land and has fought to preserve it in order to allow these people to pursue permaculture and wildcrafting -- is this expanding or how is he approaching it? WP: It's still fairly limited but he is at the community college there and teaches the permaculture courses and I think he uses that as a subversive base in training everyone in these wildcrafting skills and building a network. He's been able to buy up pieces of land because he saw that as the only way to stop the sprawl is by actually physically buying it up because private property is so respected in this country. So he has made some inroads not only in rural areas but also in some of the surrounding towns. I think he has something online now -- I don't think it worked in Siler City but there is somewhere else where he is able to do that model. JC: Beyond your book, what's your feeling on how the lessons in this immersive program can be shared, do you think there is potential to expand these programs so people from large cities could experience this -- a kind of anti-Disneyland? WP: That's interesting, an anti-Disneyland. The specific concrete things that are growing out of the book is a kind of university campaign in the fall so I am trying to organize what we are calling a texture network. The idea that life is not just about consumption and having more but it's really about having spontaneity and fun and simplicity -- having texture -- variety in life. The idea is to reach out to these students who are on the verge of deciding whether to work for a company or the government or do something alternative and inspire them that there are these other options; organic farming, alternative technologies and so on, and then to present concrete options for a leap year or for after college to build a kind of Earth corps of people who networked together. JC: You have spent a great deal of your life in remote areas, and yet you find yourself in this one area and experience a transformative experience internally and the connection you establish in the area with the people and the ecology externally. What do you attribute that to -- it did not happen before in your life it happens at this particular moment. How much of that is due to Jackie or the entire package coming together? WP: It's funny about the timing of things and when they happen. I think it was that combination of the stress the helplessness, the anger and so on that I talked about in the book building up to the point where it was intolerable. Having seen the global industrial capitalism and what it was doing in all these countries and seeing the heart of it in the States -- culture shock you could call it -- then seeing this person who was providing this very positive way of living right in the middle of our own country with people in the community of different racial classes and backgrounds and feeling inspired by that. I think it was the deep immersion in nature -- I talked about the beautiful area around No Name Creek and her 12 X 12, it all just brought something to life in me. JC: Towards the end of the book you refer to some work you have been asked to do in preserving the rainforests, is that going forward? WP: Yes it is actually. I am a senior fellow at the World Policy Institute and sort of heading up the eco-stuff and we are working in several Latin American countries around the issue of forest as part of the climate regime.